Niagara Conservation’s Rainfall Spa Showerhead offers a powerful spray with the benefits of saving energy and water. This 2.0 GPM showerhead saves 20% more water than standard showerheads. 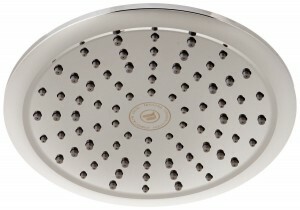 The Rainfall Spa Showerhead features a sleek, modern design wtih large 8″ diameter face plate. It’s wide, full body spray pattern provides a soothing rain shower experience 2.0 gallons per minute. Patented pressure compensating technology provides constant output regardless of available pressure. Soft rubber nozzles allow for easy cleaning. One spray function. Easy to Install.